Posted byBramus! February 13, 2005 January 13, 2019 Posted inOriginal ContentLeave a comment on Oink? To all : buy it & play it! You won’t regret it! 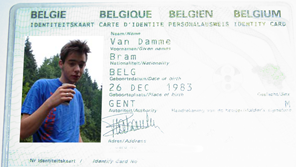 It had to be me again … here in Belgium we all have an identity card starting at age 12. All identity cards have a cardnumber and each person has an identity number (rijksregisternummer in Dutch). Gone for two weeks to France on vacation.